When I officially began marathon training in July I wasn’t really sure what to expect. The only thing I knew is that I had a comfortable long run base of 10 miles and would need to increase my distance from there. I suppose little aches here and there are just part of marathon training for most people. I feel lucky that so far I haven’t had any serious injuries. I’m extremely interested in the way my body handles running for many hours and what it needs to keep going since I want to run ultras someday. In the past I’ve tried gels and really disliked them. I’ve pretty much stuck with HoneyStinger chomps (in Orange Blossom and Cherry Blossom). 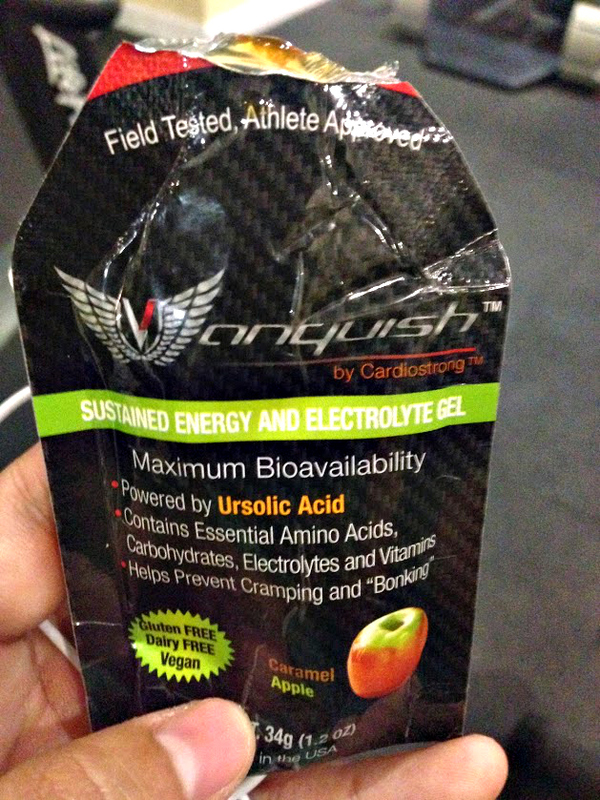 A couple weeks ago Cardiostrong reached out to me about trying their Vanquish energy gels. The main reason I don’t like Gu is because they are soooooo sweet. Vanquish gels have less sugar than Gu so I thought I’d give it a try since they offered to send me samples for free. The gels come in Raspberry and Caramel Apple. I took a tiny “sip” of the raspberry and decided it wasn’t for me since it’s really sweet even though it only has 5 grams of sugar. If you like raspberry jelly, I think you’ll love it! I tried the Caramel Apple during my long run on Saturday and liked it a lot more than the raspberry. The caramel flavor was a bit stronger than the apple flavor but they blended well. My first reaction was that it tasted a bit like apple pie! There’s no caffeine in the raspberry flavor and 50mg in the caramel apple flavor. One of the main benefits of Vanquish gels is that they have Ursolic Acid in them. Research from the University of Iowa has shown that ursolic acid helps burn fat and build muscle. I think it’s important to keep in mind that this study was conducted on mice and that researchers “don’t know if ursolic acid will benefit people.” With that being said, it sounds promising! The gels are just $1.99 ea. so definitely worth a try if you’re looking to try some new running fuel! I’m so serious, if you like apple-based desserts you’ll really like Caramel Apple! First time marathoners, what has surprised you most about training for your first marathon? Any bumps and bruises on your end? What is the FIRST thing you do after getting home from a long run? I like your marathon training reflection. The caramel apple sounds good – maybe I will give it a try. I usually avoid the gels for the same reasons you listed – too sweet and the taste is ok. I’ve never tried Stingers either. The caramel apple was the best gel I’ve ever had. I made the mistake of trying a chocolate GU as my first gel and that was just awful – it tastes and feels just like eating icing! The Vanquish gel was way less thick which I liked. I just bought some Honey Stinger chomps and I’m so excited to try them out during my next long run! I love all things sweet but not while I’m running so I’m hoping I like them! I like you, have had my fair share of bumps and bruises during marathon training, but luckily nothing serious (yet) fingers crossed it stays that way! Fingers crossed for both of us!!! I think you will really like the chomps! They are my standard go-to! I’m pretty sure that I’ve already told you I don’t do any of the gels, chews…..my stomach is kind of wonky normally and running makes it worse. I have always run on an empty stomach and that works best. However, in the past year+ while trying to run ultras I’ve found that I have to fuel (part of my problem!!!). I hope that you have found something that works for you! Maybe something like liquid like coke or a shake on-the-go would work better if your stomach doesn’t like solids? First thing I do? Skull some water and have a half-arsed quad stretch while doing so and simultaneously trying to fend off Puppy’s enthusiastic welcome-home-jump-attacks. Then: shower and hopefully: crawl back into bed. Hahahah same post-run ritual here! Cecil is probably less enthusiastic but still all up in my business as soon as I sit on the floor to stretch! When Paul told me the Dolphins beat the Pats I was like, Ooooooh Kristina is gonna be happy about that!!! And THE BILLS WON TOO???? WTF??? There’s no way to train that long w/o a few bumps and bruises but you are doing amazing! Thank you, Karen! I’ve missed you in blogland!! Several people have recommended the Honey Stingers to me and I think I am going to try them! Congrats on running 13.1 a minute/mile faster – that’s AMAZING! Way to go! My bumps and bruises during training have really been more mental than physical. Physically everything’s been fine, although I hate saying that because I feel like I’m jinxing something. My main hurdles have been just being tired and sick of all the long miles. But this weekend is my last big long run before taper time – almost there!!! I can hardly believe this weekend is the long big run! This training cycle seriously flew by!!! 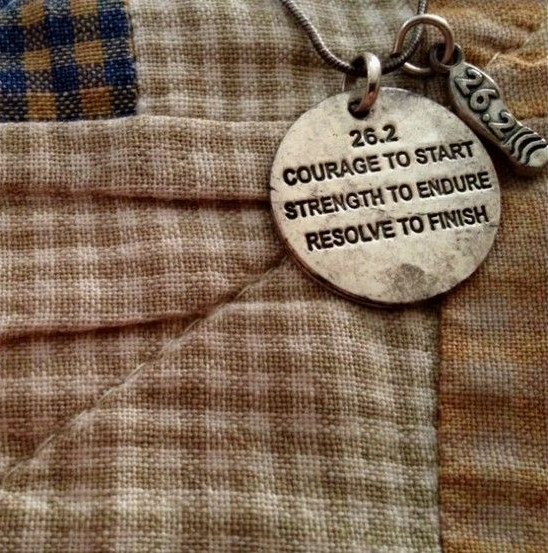 Well not actually a first time marathoner yet :)…but I have noticed how our bodies really are designed for long runs. Before doing all my running research I never would of thought 100 miles is possible. Even though I’ve only ran 15 miles, I believe 100 miles is possible. My mom is an Eagles fan, go Eagles! Way to pull off that crazy second half yesterday! Until a year and a half ago I had NO IDEA that people ran 100 miles. I would have thought it was physically impossible! It’s really crazy to think about. I don’t think 100 is in the cards for me, but I definitely think it’s in the cards for you! First thing I do when I get home from a long run is drink water and find something to eat! I used to wait way too long to eat after a long run but now I make a smoothie that I drink while I cool down and do some foam rolling. It sounds like you have had a few minor setbacks but overall a great training cycle!! I think I probably wait too long to eat. If I sit down before I start preparing something (or I’m not sure what I’m going to have), it’ll be a while before I get up again to hit the kitchen. I really should have some simple things waiting for me! The first thing I do when I get back from a long run–I down a BIG glass of water, and then go out and walk the dogs for about 1/2 mile. I find that walk REALLY helps recovery. 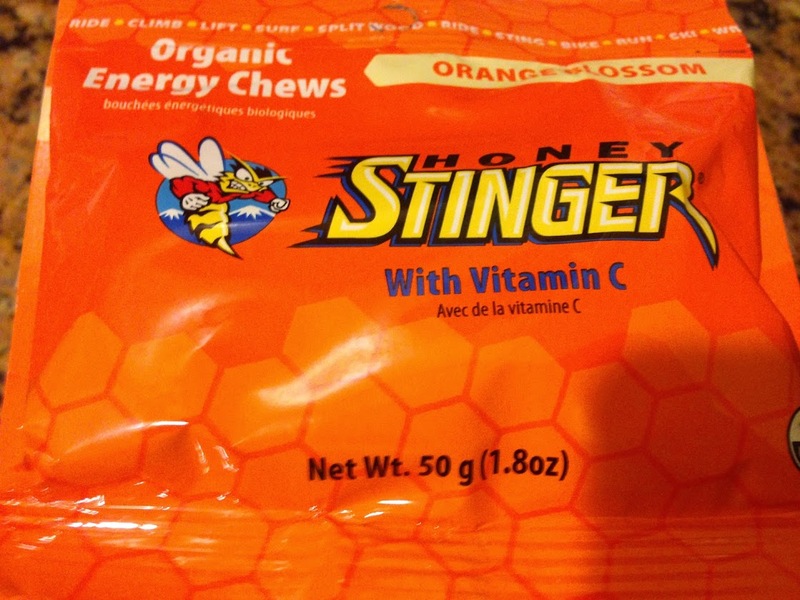 I use honey stinger chomps–only in races. I like the wafers better (I used them in my 32 miler) but that was in a drop bag. They tend to crumble in a pack…The tailwind nutrition powder is good too–not sweet. You can only order that online. Moreno was AH-MAZING!!! Can’t believe we got that guy at such a bargain this off season! What a great idea to walk the dogs as a cool down. I tell Adam several times a week that I wish we had a dog just so I could walk and run with it. I agree about the mental fatigue. I find that around mile 13 I start getting antsy. Even though physically I usually feel okay, I have to start consciously doing things to keep my mind entertained so that I don’t just…stop. The gains you have had definitely outweigh the bumps and bruises. A journey like this wouldn’t be challenging and what it is without a few obstacles thrown at you. I feel like you have been strong-minded and have fared well amongst all the injuries. Just keep fighting! Thanks, Kristen! I really wasn’t sure what to expect/how my body would hold up during marathon training. I have been really happy with how things have gone so far. I do wish I had been able to run during the days that I couldn’t, but overall I know I’ve gotten in a decent training cycle. I’m anxious for the big day to arrive now! Immediately after long runs, I treat myself with a large iced coffee from Dunkin’ Donuts. And then, since it’s usually lunch time, I enjoy a peanut butter and jelly sandwich with baked potato chips. LOL. I’m apparently very food motivated, and that’s what keeps me going in those final miles, I gotta tell ya, haha. Over the summer, we also proceeded to the pool right after lunch, which was HEAVENLY!